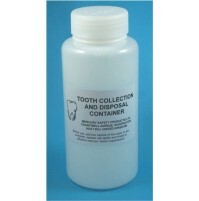 All you need for quick, safe and easy collection, storage and disposal of mercury-rich waste in the dental surgery. Use it to remove and collect amalgam waste from the suction trap and other sources. The waste is stored under a mercury vapour suppressant solution in a shatter proof, leakproof 500ml container for disposal when full. Supplied with a brush and scoop for waste handling. Includes full instructions with the kit.